Leading Wholesale Trader of non woven fabric production line, deep touch polishing machine, raising machines, knitting machine parts and collar knitting machine from Ludhiana. Our expertise lies in making available latest technology based process machinery that find use in the installation of Non Woven Fabric Production Line. Our team has extensive experience in the setting of different assembly lines like thermo bond nonwoven interlining line, soaking nonwoven interlining line, polyester wadding production line, hot air nonwoven production line and others. 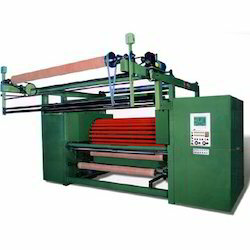 These production lines provide for professional output in form of making non-woven fabrics in different colors and weights. These systems also allow easy creation of different designs like cross, dot, line and others to make the gloves look more attractive and visually appealing. Finding suitability in applications like polishing of polyester blankets, these high performance Deep Touch Polishing Machine offered provide suitable support for polishing of woolens, warp knitted fabrics, polyester blanket, fake fur, all types of natural and chemical fiber among others. Further, the polishing machine is mainly used for processing of woolen, blanket, polish velvet, high pile knitted fabric, cotton fabrics among others. With higher working efficiency, these are also easy to operate and provide for superior polishing results. Some of its advantages include choice of adjusting fabric speeds, numerical display support, rollers suitable for running on both forward and reverse movement among others. Finding use in production of hairy surface on fabrics, these latest technology based Raising Machines come with support of series of needles that are used in fiber penetration & in breaking and lifting them. Finding suitability for meeting surface raising demands of chemical fiber, open width knitted fabrics, tubular knitted fabrics as well as in processes involving surface raising of blanket, worst woolen and others, the high speed performance of the system provides for optimum production outputs. 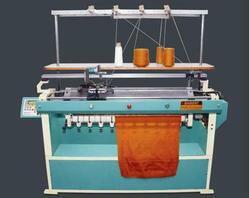 Its user friendly interface also makes it highly demanded by the customers. Being a client centric organization, we are engaged in trading a compact array of high performing Knitting Machine Parts to our valued clients. Offered range of knitting machines is fabricated with utmost precision by employing advanced and modern technological production methods that enable in long working hours and durability. In addition to this, for better output, our range of quality tested as per industry laid parameters to ensure their error free nature. Being a client centric organization, we are engaged in trading a compact array of high performing Collar Knitting Machine to our valued clients.